Alzheimer's disease has become one of the most common diseases in USA and around the world these days. According to the estimated reports 5 million people in America are suffering from this neurological disorder which cause severe memory loss as it grows. 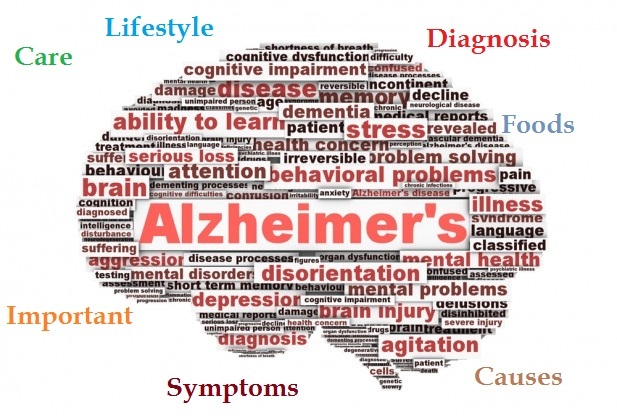 The cause of Alzheimer's disease is associated with brain cell death, aging and head injuries. Scientists are doing researches to find out the exact causes and cure for this disease. It is advised to have knowledge about this disease to track the changes happening when we have someone with these symptoms, so proper care can be taken. We will look at the common symptoms and some suggestions relating to the Alzheimer's disease. 1. In the primary stage of Alzheimer's disease the longtime memories are good but the patient forget the recent memories and happenings. They keep asking the same question repeatedly. Forget even regularly used words and daily activities. 2. Change in behavior is observed and get confused most of the times. They might lose the travel routes even at the regular places. Changing moods and inability to take the right decisions. Change in dressing style and forgetting to take bath are some of the symptoms seen in Alzheimer's affected people. 3. If the above symptoms are seen in a person it is advised to contact doctor or medical assistance for clarity on the issue. Because in some thyroid problems there are chances of memory loss which can be cured with medicines. So it is very important to diagnose Alzheimer's in first stage for better cure. 4. The progression of Alzheimer's disease varies from person to person. In some people it develop slowly and in some it progresses very fast. In some cases this condition will take about 20 years to fully develop into disease. 5. Alzheimer's disease diagnosis process will include mental condition tests, neurological test, brain scans, urine and blood tests. There are also reasons that cause Dementia, so only proper diagnosis and tests are needed act to find the reason behind. 6. There is no particular cure for Alzheimer's disease at present but there are medicines to slow down the process. Diagnosing disease at the earliest stage is the key factor in battling this disease. 7. Scientists are conducting researches to prevent and reduce the Alzheimer's disease. According to the studies foods like beans, fish , olive oil, white tea, oolong tea, salmon, mackerel, tuna, berries can reduce the risk of Alzheimer's disease. 8. Regular exercise and other physical activities can keep you away from Alzheimer's disease.